Just what I need: another Bible! My biggest complaints in the past is our utter dependence on study Bibles. We don’t study the Bible enough! Also, I’m not a personal fan of the New Living Translation. I like it as a pastor, however. It is a great translation to give to people who have not spent many years reading the Bible. So, I get this Bible from Tyndale for review. I am not under any obligation to give it a positive review. But I must say I really like this concept! It is not meant to be a study Bible. It is meant to be more of a “spiritual formation” Bible. There are topics to explore, but they are all related to attributes of God. It is an attempt to get the reader to slow down. Think. Meditate. Pray. There are key articles on the attribute of God at the end of the biblical text. There are also helpful articles within the text. It is organized well. You get the entire text of the New Living Translation with devotional/prayer commentaries alongside. The format is not overwhelming at all. If I want to just read the text, the small commentaries along the way don’t get in the way too much. Overall, I think this is a good addition for believers. We need to slow it down. We need some help in drawing our thoughts to God. 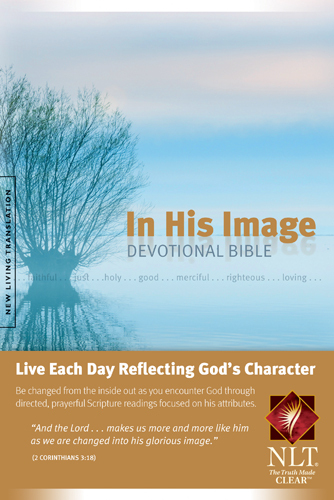 This devotional Bible is worth the look. THAT SAID… (so I won’t post what is next on Amazon or anything). Should the NIV2011 edition be a good one, I will then wait until next year to make a purchase of it in print. Should it disappoint as an update, I will not plan any future purchases. Blogs I have followed are making good points. With all of our translation wars in this country, we are getting spoiled with all kinds of translations while there are areas of the world yet to get the Bible in their own language. In that spirit, I am going to make a pledge. The money I would foolishly spend on buying yet another Bible for myself will be spent on agencies getting the Bible out to people who desperately need it around the world. (It’s not much. Maybe $100 a year or something.) But I want to break my own addiction and work to make sure the power of the Word reaches millions who have yet to read the living words of Christ in their own language. At any rate, concerning THIS particular Bible, I give it a good thumbs up. I have a “NIV Mens Study Bible” which I rarely use and found I didn’t like it since the day I got it. I was also given a Dakes or Drakes Bible… which the print is too small and the KJV distracting. I have a devotional journal based on the psalms which I have been working through this year and found it better. I prefer a plain Bible because I can read it for myself, think for myself and throw myself upon the Lord to help me understand. Then I can go to a commentary later. A while ago I visited the firemaniacs blog just to see what they were up to and one of the posters had made a real great suggestion and I’m not sure if he was thinking out loud or its a real Bible… He was saying its in A4 loose leaf form. This means you can place it into a folder and put A4 note paper into between the sheaves…. Now this got me excited because that is a Bible format I could really use. I’m with you on personal Bibles. I have a wide margin ESV from Cambridge that is great. If the TNIV2011 is what I’m hoping for, I will pray they get a wide margin edition out soon so I can use it. As to this particular Bible, while I may not use it personally, I do find it useful for spiritual formation.